Now that the cold weather has set in, what’s your go-to winter warmer? A big bowl of chicken soup? A tumbler of whisky? If you are in Hong Kong in late autumn or winter, you may want to give snake soup a go. In traditional Chinese medicine, snake meat is considered a “warming” food that promotes blood circulation and hence is perfect to counter the cold weather. Once winter hits, some locals will head to the snake restaurants in Hong Kong to enjoy some snake delicacies. Modern snake restaurants look like normal diners, and usually offer other snake-free dishes for the less adventurous eaters. But if you are looking for an authentic snake soup experience, I would recommend one of those traditional snake stores where you are surrounded by live (and caged, of course) snakes. You can usually find some “harmless” snakes in wired cages at the store front, and some poisonous ones in wooden drawers at the back. When you slurp on your snake soup, you can see snakes flickering their tongues and slithering in their cages. It may sound a bit psychopathic eating snake soup in front of live snakes. But trust me, it’s a truly unique experience that you simply can’t pass. Good snake restaurants never reveal the secret ingredients in their snake soup recipes. But a typical recipe calls for two to five types of snakes (whose flesh is shredded), chicken, pork, shiitake mushrooms, abalone, ginger, dried tangerine peel, lemon leaves, and other spices. A good snake soup takes not only a long list of ingredients, but also long hours of simmering and stewing. 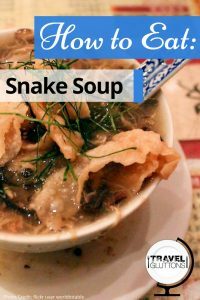 There are two kinds of snake soup: a broth-like soup, and a thick soup that is mixed with a thickener like corn starch. Because of the mix of ingredients, the soup has a very complex texture that is difficult to describe. It’s chewy, soft, slippery, and sticky at the same time. Thanks to the spices, the soup is slightly sweet with a hint of fishy taste. Always eat it hot because the soup has a gamey, fishy smell when it is cold. A Chinese spoon comes in handy so you won’t burn your mouth. 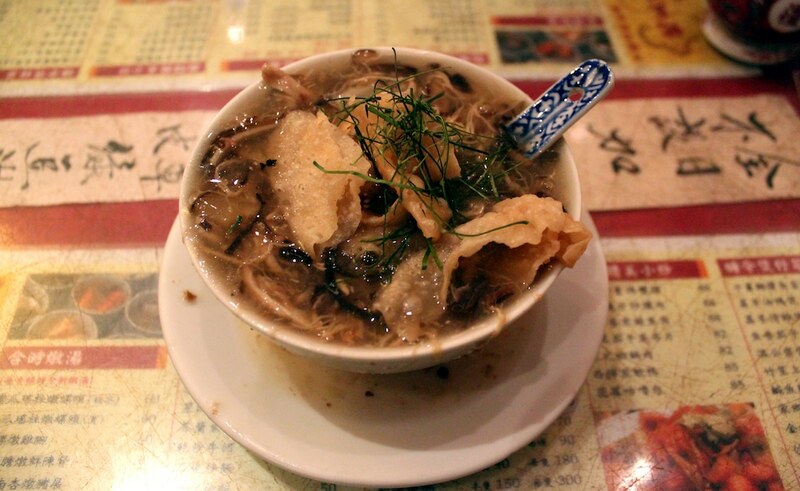 Deep fried crackers (think fried wonton skins) can be added to introduce a crunchy texture that contrasts the soup. Leave them in the soup for a bit longer so they still have a slightly crunchy texture while they are soaked up with the flavours of the soup. Chrysanthemum leaves can be sprinkled on top of the soup to add sweetness, and slivers of lemon leaves to add extra flavour. Snake soup first-timers may consider a dash of white pepper or vinegar to enrich the flavour of the soup and overcome the slightly fishy taste. It is common to order sticky rice with snake soup as they go really well together. The sticky rice is normally packed with glutinous rice, Chinese sausages, preserved pork belly, and peanuts. Both sticky rice and snake soup can be really filling. So if you want to try everything, make sure you enter a snake restaurant with an empty stomach. A few traditional snake stores still offer fresh gall bladder. It’s not for the faint-hearted as the snake handler will make a small incision on the snake and retrieve the gall bladder in front of you. In a small bowl, the fresh gall bladder is pierced and mixed with some strong Chinese alcohol. You can then down it quickly like a shot. It’s believed to improve virility. Beware though, consumption of snake bile may have the risk of contracting parasites. Rumour has it that the snake soup industry in Hong Kong is on the decline. Few people enter the profession because of the danger of handling venomous snakes. 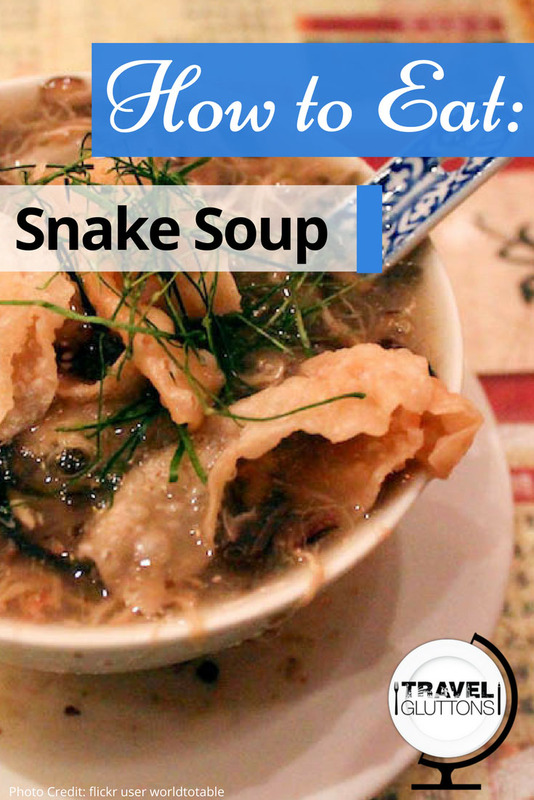 All the more reason to try snake soup next time you’re there! 2 Responses to "How to Eat: Snake Soup"